Adam Barnett and Duncan Ebata share the same enthusiasm for building vibrant and resilient communities. 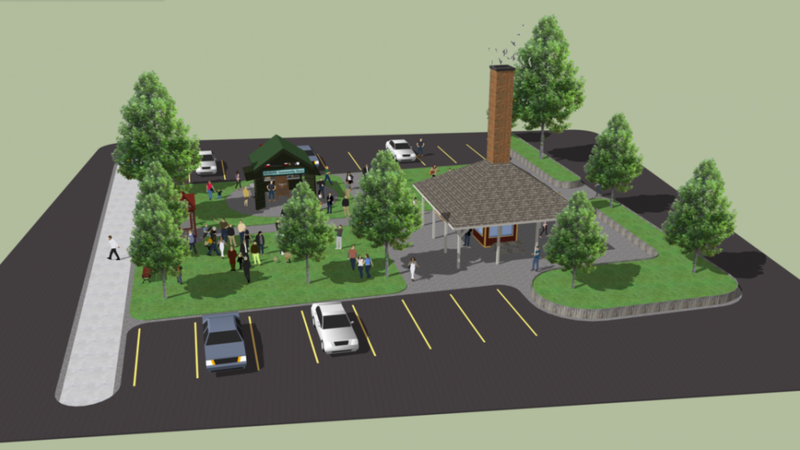 This common interest, matched with their take-action approach to ideas, has resulted in a collaborative effort to build a community oven in Wolfville’s Robie Tufts Nature Park. Before we delve into this any further, it may be prudent to quell any presuppositions that the community oven will be built in or around the chimney that is home to the threatened chimney swifts. The accompanying image illustrates the proposed location of the oven. Fear not – those chimney swifts will still enjoy their protected abode! Adam and Duncan approached the Town of Wolfville in 2017 with the idea of a community oven in a public park. They were inspired by the Park Avenue Community Oven project in Dartmouth, which was built in 2013 and has been a huge success. The Dartmouth oven is a community-led project, and volunteers offer Saturday morning public baking sessions and Sunday morning cooking lessons. On average, the Dartmouth community oven is booked 160 times per year. Adam and Duncan also share mutual friends who have built wood-fired ovens in their backyards, and they have observed the power of coming together over food. Travis Mills was one of these friends. Last summer, Travis and his partner, local artist Miyoshi Kondo, held a backyard pizza-making party using an oven Travis built himself. His help has been solicited to build the community oven in Wolfville. The oven should take six to eight weeks to build, and they hope to have it complete by the end of September. Adam and Duncan are excited about the location’s proximity to the Wolfville Farmers’ Market, and see many opportunities to tie it into market programming. They also hope that the community finds ways to use the oven and make it their own. Adam says, “It’s about connecting people, sharing food, and gathering together.” Duncan points out that public community assets often attract youth and seniors, and he hopes that these two groups will share in the experience together. “Evidence shows that happiness and long life are connected to spaces that bring people together,” he explains. He sees a community oven as a social neutralizer since it is low-cost, accessible to all, and easy to use. Adam and Duncan talk excitedly about how the community oven could be used. They suggest bread baking sessions, baking lessons, food education, gatherings and celebrations, outdoor movie viewings, live music or theatre with freshly-made snacks, and community pizza nights. In order to use the space, the community oven will need to be pre-booked, and a volunteer will start the fire. The fire takes a couple of hours to heat up, but once it reaches a high heat, pizza can be baked within a minute. A Kickstarter campaign has been launched to see the community oven project through. Visit wolfvilleoven.com for more information on the project, and a link to the Kickstarter campaign.